Officially, Sun City is merely a place rather than a town or city, but with a population around 40,000 the community is large, one of the major suburbs of west Phoenix. 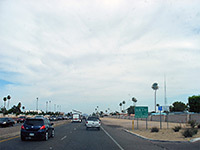 US 60 (Grand Avenue) cuts across the area, which is almost all residential; pleasant, modern housing estates liberally lined with palm trees and other desert plants. The southern section is centered on three golf courses, North, South and Sun City, while to the north are several more courses and country clubs, together with a few artificial lakes. Many of the streets in this area are built as a series of concentric circles, with shops or other community facilities at the center. The town is especially popular with retirees. Sun City is bordered approximately by the New River and Loop 101 to the east and the Agua Fria River to the west, with open countryside not far beyond, either farmland or undeveloped desert; one nearby attraction is Lake Pleasant, 22 miles north. Following the 2016 closure of Best Western Inn & Suites there are currently no chain hotels in Sun City.